If you like views of the ocean, beach, sea-grass covered dunes, and swaying palm trees then you’re going to love this North Forest Beach oceanfront home! An expansive outdoor sun-kissed and sea-breeze swept living space has a *heated pool and plenty of room for lazy days of sunbathing. The fun doesn’t stop there. Step in from the pool, on the first floor to a family gaming room equipped with a ping pong table, TV, and DVD player. The entire 2nd floor is designed with an open concept that encompasses a spacious fully renovated kitchen, dining room, and living room. 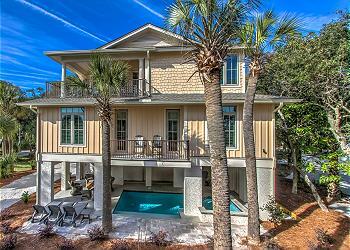 This all opens to a massive screened in porch that overlooks the pool, beach, and ocean just beyond. There are hypnotic island views seemingly everywhere you look, so much so you’ll have to pinch yourself that it’s not a dream. •	Private *heated pool (12 x 30) *This pool has a gas heater and can be heated for an additional fee of $575-$875 + tax per week depending on the season. •	*Pool can be heated at an additional charge. This pool has a gas pool heater. The cost per week is $575.00 to $1000.00 (depending on the season) to heat Pool.